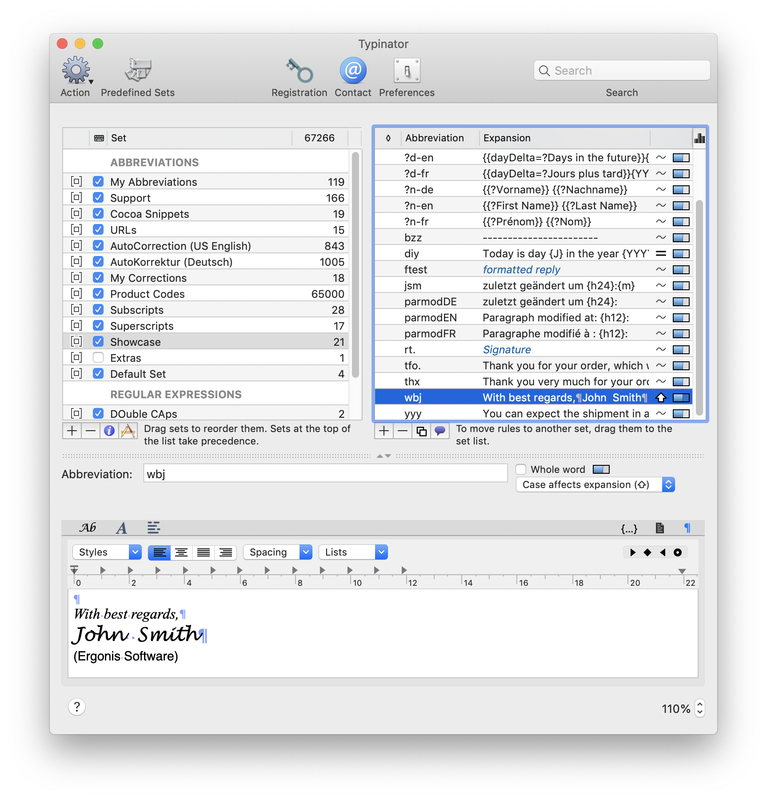 [prMac.com] Hagenberg, Austria - Ergonis Software today announced the immediate availability of a new HTML snippets set for Typinator, its highly acclaimed tool for auto-typing text system-wide across all Mac OS X applications. The new HTML set provides over 100 abbreviations for elements of the HTML 4.01 standard. With this set installed in Typinator, you just type a short abbreviation and Typinator will insert the corresponding HTML code and place the insertion point appropriately. "Regardless what tool they are using, most web designers are typing plain HTML code all the time, sometimes at least assisted by their HTML editor. And most guys who type plain HTML code are keyboard junkies, who want to move their hands off the keyboard only when absolutely necessary," said Christoph Reichenberger, founder and CEO of Ergonis Software. "With the new HTML snippets set for Typinator, you can insert over 100 HTML elements without having to click through a list of templates. Just type a double less-than sign followed by the name of the desired HTML element and Typinator will insert the corresponding HTML code and place the insertion point appropriately. This will not only save you a lot of time and thousands of keystrokes but will also eliminate typing errors". Typinator is a powerful, yet elegantly simple solution that works across all applications to detect specific sequences of typed characters and to automatically replace them with text snippets, graphics, URLs, dates and special characters. Typinator requires Mac OS X version 10.4 or newer. It is fully compatible with Mac OS X 10.5 (Leopard). Visit Ergonis Software's website to learn more about Typinator and to download the new HTML set. The HTML snippets set can be downloaded free of charge from the Ergonis web site and requires Typinator 2.0 or newer (Typinator 3.0 is recommended). Typinator can be purchased securely on the Ergonis Software web site. For information about purchases, including enterprise licenses, volume discounts, and upgrade pricing offers, visit the website. Instead of purchasing Typinator by itself, customers can get the Macility Productivity Bundle that also contains two of the company's other productivity tools, PopChar X and KeyCue. The pricing of the Productivity Bundle represents a saving of more than 35% over the separate purchase of its components. More information about the Productivity Bundle can be found at their website. Ergonis Software develops ergonomic and intuitive software that boosts the productivity of Mac and PC users. Ergonis Software, a privately held company founded in 2002, is headquartered in Hagenberg, Austria. Ergonis and Typinator are either registered trademarks or trademarks of Ergonis Software GmbH. Other company and product names may be trademarks of their respective owners. An Online press kit, including screenshots, is available on the Ergonis Software website.